Dr Richard Munang is the Africa Regional Climate Change Programme Coordinator with UN Environment (UNEP), based in Nairobi. The Cameroonian by birth talked to us about his new book “Making Africa work through the Power of Innovative Volunteerism”. In it, he explains that Africa’s true resource is human capital and details how collectivism, not individualism, can advance Africa’s agro-industrial economies, by connecting motivated youth in inclusive market-driven partnerships to create inclusive wealth and drive the implementation of climate action. 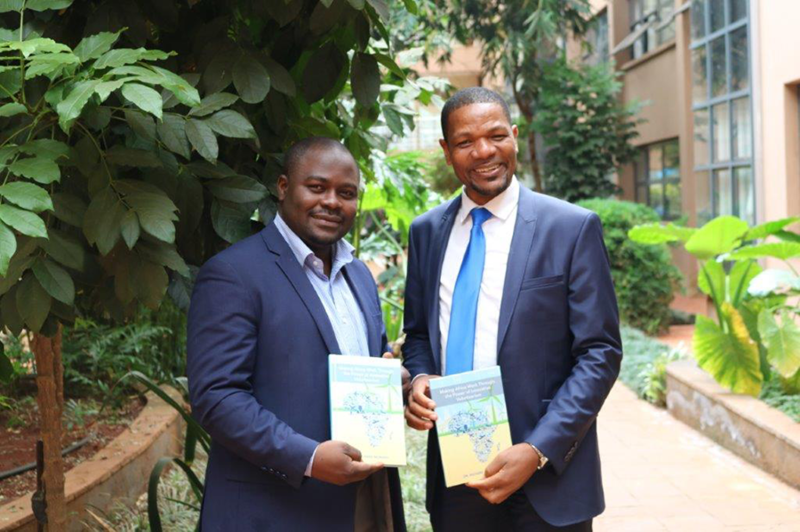 UNV Regional Manager Njoya Tikum and Dr Richard Munang, Africa Regional Climate Change Programme Coordinator with UN Environment (UNEP). The inspiration behind putting the book together was this misconception that the African continent is driven by physical resources, like minerals and oil. What is much more crucial is human capital, because skills and talents are needed to really drive change. We need to harness Africa’s skills and build these talents, particularly among youth. This book addresses how human capital can become financial capital if it is harnessed correctly – because human capital and financial capital are what actually drive transformational change. Everybody talks about the youth bulge in Africa. How can we harness this immense energy and potential? Over 60 per cent of Africa’s population is under 35 years old. This is a problem when we look at the number of graduates that leave university every year and join the labour market – the number is nearly 12 million! On the other hand, we only have 3 million jobs every year. We need to tap into the passion of these young people. That’s why we need a framework where we are able to harness this energy and inject it into the catalytic sectors – the sectors that actually drive real change, change where the people from the bottom of the pyramid are lifted. That’s the agricultural sector and the clean energy sector. However, to really address poverty and unemployment in a broader manner, we need enablers that you can link to agriculture. If you have young people with ICT skills, infrastructure, industrialization or energy qualifications, you can link them to farmers to help them access markets. This way they will become solution providers aiding food security and creating inclusive wealth. We need to help them set up their own businesses – be it clean energy or solar driers – and link them to actors on the ground who actually work in agriculture. Youth are faced with many challenges, yes, but these challenges also present opportunities. You believe in the power of innovative volunteerism. What exactly is that? Innovative volunteerism is a concept which leverages skills, talents, experiences and utilizes these skills to drive change for everybody’s benefit. The difference between innovative volunteerism and volunteerism per se is that with the latter, everybody’s skills and talents matter. I believe that when your skill is linked to another person’s skill, everyone wins. I have a good example: take a youth who specializes in ICT, but might not understand agriculture and farming. Then connect that youth to a farmer who needs access to a market. The youth can connect the farmer to the market using ICT. So, both are utilizing their skills and in the end, they will make more money. We need to see ourselves as solution providers, but we need to be linked with other actors that are already in their field. The innovative part is that alone we can do very little. Collectively, we can do more. Addressing challenges in a collective and inclusive way provides opportunities for each and everybody who is part of it. While everybody benefits, in the end we can solve the bigger problem. With the changing climate nowadays, we cannot see problems in silos anymore. We need to foster synergy but also foster a spirit of selflessness, collectivism and hopefulness. And these are the essences of innovative volunteerism. Innovative volunteerism needs to be geared towards a common vision which is to create wealth and address issues of poverty. Where do you see the role of the UN when it comes to innovative volunteerism? To ensure inclusion and engage each and every one – individuals, private sector, civil society organizations, policy makers, etc. – needs to be part of the process. But to ensure that everybody will be engaged, we need to build an environment where we can harness everybody’s skills, and thus ensure that everyone comes together to achieve the Sustainable Development Goals (SDGs). That’s why we need to look at different approaches. Taking a paradigm shift is something that the UN can do and is the best approach to use so that the SDGs can be achieved. In your view, are UN Volunteers innovative volunteers? UN Volunteers do amazing work all around the world. They are human capital; the work that they do is worth more than money and helps to drive resilient societies. What they are doing is already innovative volunteerism. What my book provides is a novel toolkit that can be utilized by UN Volunteers to engage other actors, outside of the UN system, so that they can utilize their skills and give their best in whatever they are doing to contribute to the implementation of the SDGs, through the lenses of inclusive market-driven partnerships. An ocean is formed little by little by drops of water, and if we bring everyone together we will be able to implement the SDGs and drive transformational change for people and planet.